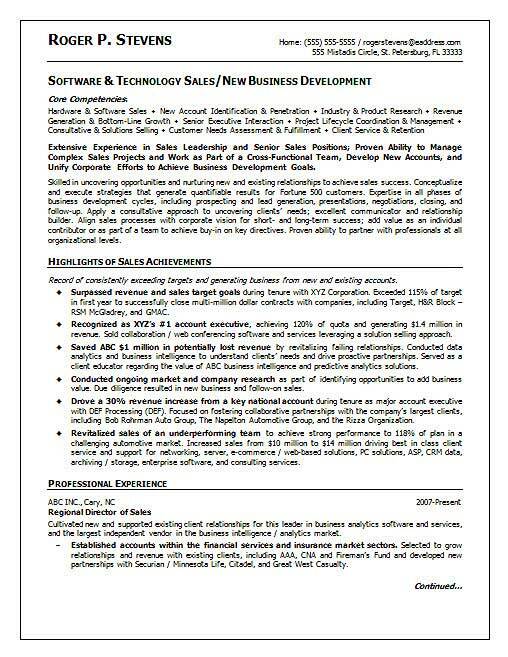 Below we have a career document for an IT sales professional with experience in software sales and new business development. The example serves as a good resource for any information technology or scientific sales job target. The resume starts with a section on core competencies such as new account penetration, product research, project management, consulting, customer needs assessment, client services and technology sales. The job seeker identifies extensive experience in senior software sales positions and highlights the ability to achieve bushiness development guidelines. 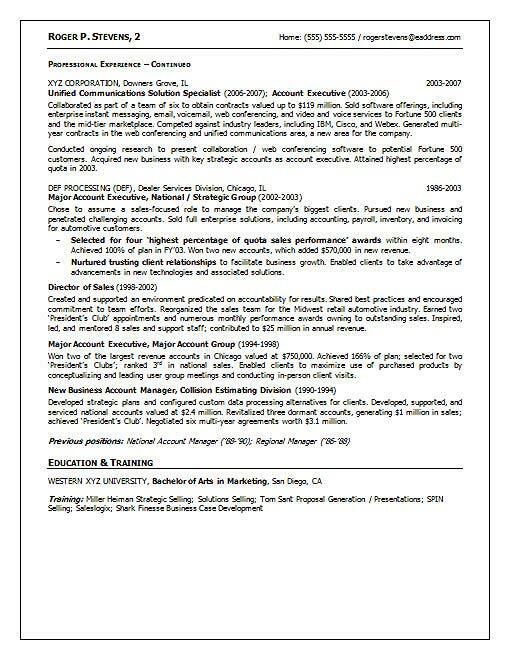 This resume also emphasizes sales achievements with a list of accomplishments reaching sales targets, saving lost revenue and landing a key account. The candidate lists positions as Regional Director of Sales and Major Account Executive that documents specific responsibilities and achievements. The writer also includes information about their Bachelor of Arts in Marketing as well related training. Drive efforts to meet monthly and annual sales goals on software sales and new margin sales for the year. Utilize networking skills to build list of prospects to contact for new business. Track customers and prospects in CRM system including records of all contact. Develop and conduct online webinars to demonstrate software capabilities. Visit customer locations to provide presentations to technical staff and management. Serve additional role as technical advisor to clients leveraging thorough knowledge of company and competitor software. Oversee product sales lifecycle from closing to delivery through technical support. Develop forecast of industry, company and product line sales collaborating with sales team to set quotas. Work diligently with existing clients to ensure software is functional, updated and supported.